The A/C system is made up of five main components to make the air in your car blow cool: The compressor, condenser, receiver-dryer, expansion valve, and evaporator. The A/C system is also made up of two sides, the high-pressure side and low-pressure side. The high-pressure side contains the compressor, condenser, and receiver-dryer. The low-pressure side contains the expansion valve and evaporator. Compressor - The compressor is a pump that’s driven by your cars belt. When the refrigerant enters into the compressor, it is in a low-pressure gas. When the gas is inside the compressor it compresses the gas into a high pressure and forces it out to the condenser. Condenser - The condenser is there to radiate heat out of the system. The refrigerant enters the condenser as a pressurized gas from the compressor. The pressurizing of the gas and moving it to the condenser creates heat, but by air flowing through the condenser it cools down the refrigerant until it forms into a liquid again. The high-pressure refrigerant is now a liquid and is sent to the receiver/drier. 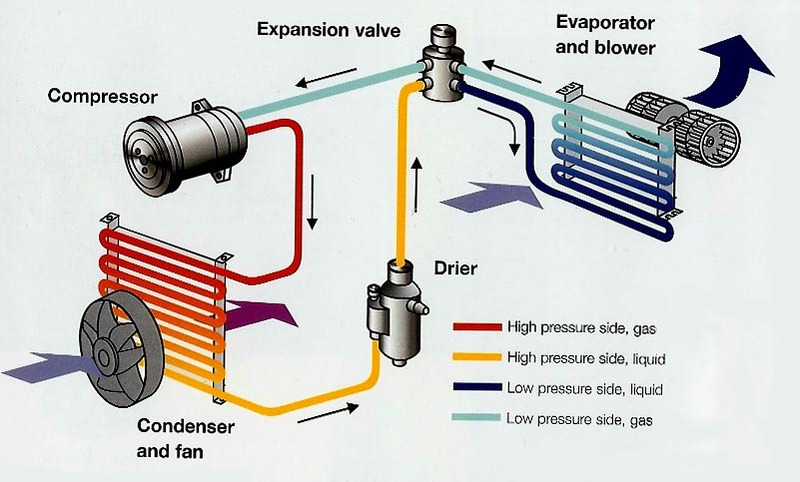 Receiver-Drier - When the refrigerant moves from the condenser, the liquid goes through the receiver-dryer, which contains a moisture absorber that removes unwanted water from the refrigerant. The receiver-dryer then removes any water that has entered the system. If the water stays in the system it can form into ice crystals, which can damage the a/c system. Expansion Valve - The expansion valve is where the system changes from the high-pressure side to the low-pressure side. The high-pressure liquid moves through the receiver-dryer to the expansion valve, where it then expands, cooling the refrigerant. When the refrigerant expands it reduces the pressure, so it can go through the evaporator. The expansion valve regulates the flow of refrigerant, so the refrigerant can flow steadily. Some vehicles have an orifice tube instead of an expansion valve, but it acts as the same as an expansion valve by lowering the pressure and cooling the refrigerant before enters the evaporator. Evaporator - Refrigerant enters the evaporator as a cold, low-pressure liquid. The temperature inside the car is enough to make the refrigerant in the evaporator boil and become a gas again. When the refrigerant is in a gas form can absorb a lot of the heat. The gas then moves out of the evaporator taking the heat with it. A fan blowing on the evaporator blows cool air into the car. The refrigerant then goes back to the compressor, where it starts the whole process all over again. Brakes - why your car is able to stop when you need it to. 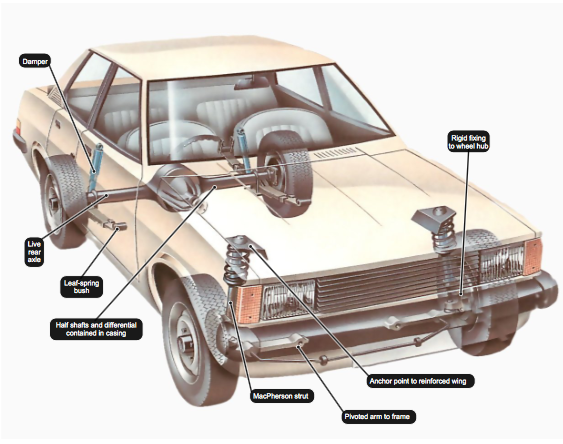 There are a lot of components to the braking system so ill just cover the main components and how it makes your car stop. All cars are different when it comes to brakes. Some cars have ABS (Anti-Lock Braking System) some don’t, some cars have all disc brakes where others don’t and the list goes on. The main components to the braking system are the brake pedal, master cylinder, brake lines, calipers/wheel cylinder, pads/shoes, and rotors/drums. Without one of these major components working properly your car will have a hard time stopping or may not stop at all. Brake Pedal – The brake pedal is what allows you to tell your car to stop. By pushing down on the brake pedal you are activating the master cylinder. Master Cylinder – The master cylinder is what holds the reservoir for your brake fluid and also sends pressure to your brake lines making your car stop. Brake Lines – The brake line(s) connects to your master cylinder and sends the pressure from it to your calipers/wheel cylinder. Calipers/Wheel Cylinder – When the caliper/wheel cylinder receives the pressure from the master cylinder is pushes the pistons out against the pads/shoes. Pads/Shoes - When the piston pushes the pads/shoes it forces the pads/shoes to rub against the rotors/drums creating friction slowing your car down. Rotors/Drums – Your rotor/drum is connected to your tires by being bolted in between the lug bolts and nuts, so when the rotors/drums are being slowed down by the pads/shoes, it’s slowing your tires down to stop your car. Your car’s electrical system consists of the battery, starter and alternator. The battery provides juice to the starter. Then, the alternator gives that battery the energy it needs to power your car. If one of these parts is not working properly, your car won’t start or run correctly. Our expert technicians can perform an electrical system check to ensure everything is working properly. It pinpoints any problems that may occur with your electrical system. If our technicians find a problem, they’ll let you know what they can do to fix it. We can curb any problem before it starts, so you won’t be left stranded with a non-starting vehicle. Until your vehicle starts, your battery is providing the car’s entire electrical current. This includes the current to the ignition and fuel systems, which are responsible for creating the combustion necessary for your engine to function. It’s difficult to determine when a starter will fail exactly, but an electrical system check at Firestone Complete Auto Care can help recognize the warning signs. We check if the starter is drawing the proper amount of current. An excessive current draw will indicate a worn starter, while a low current draw points to corroded cables or connections. Not to worry! This is a problem our expert technicians can fix. When your engine is running, the alternator keeps the battery charged and the electrical system going. Your car can start with a faulty alternator, but it won’t be able to run for an extended period of time. If the alternator requires replacement, your vehicle’s electrical system will perform erratically, its battery will discharge, and eventually your engine will lose power. A complete electrical system check from Firestone Complete Auto Care will tell you whether the alternator is generating the proper amount of current and voltage. That way, you have a heads up before your alternator fails.